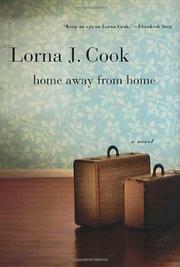 Second-novelist Cook (Departures, 2004) follows a young Michigan woman’s emotional recovery after her husband’s death. Anna, an Upward Bound administrator working with promising kids from economically deprived backgrounds, is devastated when her husband, Dill, a graphic designer with whom she’s been rapturously happy, dies of an aneurysm. It doesn’t help that Anna feels responsible: maybe if she’d arranged to have their broken garage door fixed, he would have reached the hospital in time. After the funeral, Anna finds she just can’t return to the home she and Dill shared. And so, after seven weeks with her mother, who has never quite recovered from the death of Anna’s father—her parents’ intense romance always made Anna feel a little left out—she moves from friend to friend, then into a dorm of the college where she’s running a summer program, and eventually into a rented room. She becomes involved in the family of one of her students, whose younger brother lies comatose in the hospital after a car accident. She and the driver of the car have a brief but torrid affair fueled by their shared sense of survivor’s guilt; when the boy wakes up, the relationship breaks off. After dropping out of her grief group, Anna develops a friendship with a fellow group member, John, whose primary concern is how his ten-year-old daughter, Celia, is adjusting to her mother’s death. Anna starts tutoring Celia. As the two connect, she also thinks a relationship with John might be possible, but he has already become involved with someone else. Meanwhile, Dill pays predictable “visits.” At a party that happens to fall on the first anniversary of his death, Anna gets in touch with her anger and begins to feel whole. Finally, she returns home. Even usually empathetic readers can be forgiven a yawn. Neither bland Anna nor her earnest but shopworn story brings new energy or insight to the process of loss.